Romney got 73.6 percent of the votes cast for president in the county and beat the 70.8 percent that John McCain got in the county four years ago. Obama’s 24.8 percent of the vote on Tuesday was down from his 28.2 percent in 2008. Click the figure to enlarge it. Romney even beat George W. Bush’s 2004 figure of 72.5 percent, and Romney’s percentage was the highest achieved by a Republican presidential candidate in the county going back to at least 1992. On Tuesday, only 80.0 percent of the voters went to the polls, compared with 84.4 percent four years earlier. In total, 17,889 voters cast a ballot on Tuesday, up from 17,208 four years earlier. Registration increased from 20,397 in 2008 to 22,362 this year. Libertarian Gary Johnson got 288 votes (1.6 percent) on Tuesday, compared Bob Barr’s 177 votes (1.0 percent) as the Libertarian candidate in 2008, or a gain of 111 votes. In Georgia as a whole, Romney got 53.3 percent of the vote, making the state the second closest among those states that Romney carried. Romney got 50.6 percent of the vote in North Carolina, which was in contention during the campaign. McCain carried Georgia in 2008 with 52.2 percent of the vote. Oconee County, with its 73.6 percent vote total for Romney on Tuesday, ranked 42nd out of Georgia’s 159 counties in terms of the percent voting for Romney. Jackson (80.8 percent), Walton (77.2 percent), and Barrow (74.3 percent) all ranked higher. The vote in Clarke County was 34.4 percent for Romney. Only seven counties gave Romney a lower percentage. Obama did best in the state in and around Atlanta, in Athens/Clarke County, in Chatham and Liberty counties on the coast, and in the belt from Augusta to Columbus and Albany, including Bibb County and Macon. Oconee County voters decided against Amendment 1, which gives the state more control over charter schools, with 52.0 percent opposed and 48.0 percent in favor. In the state as a whole, 58.6 percent favored the amendment, while 41.4 percent opposed. Both the Oconee County Board of Education and the Oconee County Chamber of Commerce asked voters to vote against the amendment. 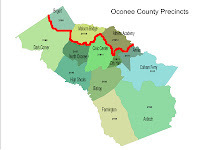 Oconee County ranked 98 out of 159 counties in its level of support for the amendment. Clarke County, with 45.8 percent voting in support, was ranked 112 in terms of support. Barrow (64.1 percent), Walton (62.1 percent) and Jackson (52.6 percent) supported the amendment. The majority of Oconee County voters (65.5 percent) supported Amendment 2, which allowed the state to sign multiple year leases. This was a little higher than the state figure of 63.8 percent. Oconee County voters gave a higher percentage of their vote (73.0 percent) to Republican Chuck Eaton for public service commissioner than did voters around the state (52.1 percent). Eaton is the incumbent. Oconee County voters also gave more support to Republican Stan Wise (79.3 percent) in the second Public Service Commission race than did voters overall (65.8 percent). Wise also is the incumbent. 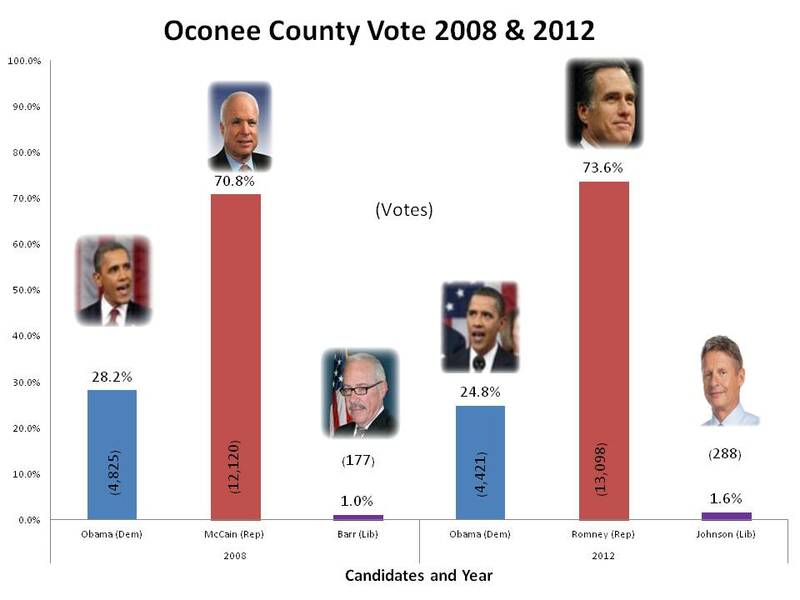 The other races on the Oconee County ballot were uncontested, and many voters passed over them. While 17,807 votes were cast in the presidential race, none of the local races got more than 14,724 votes. That figure was achieved by Angela Watson, running unopposed for Superior Court Clerk. Congressman Paul Broun got only 13,132 votes. A total of 1,480 voters wrote in another name on the ballot, with Charles Darwin getting 908 votes and Pete McCommons or Pete McCommunist getting 20 votes. Critics of Broun’s statements about evolution offered Darwin as an alternative. McCommons, the publisher of Flagpole, the alternative weekly in Athens, had proposed Pete McCommunist, a fictitious person, as another alternative. Carole Amos, deputy registrar with the Oconee County Board of Elections and Registration, gave me on Friday the complete list of write-in votes for all of the offices on the ballot. Romney’s poorest showing was in City Hall Precinct in Watkinsville, where he got 63.7 percent of the vote. His next weakest performance was in Annex Precinct (69.5 percent) and Athens Academy, with 69.6 percent. The largest No vote on Amendment 1 came from Farmington, where 57.8 percent of the voters opposed the amendment. Bogart (47.3 percent) and Athens Academy (48.8 percent) were least opposed to the amendment. Thanks for your detailed and always-valuable reporting! I agree. Thank you for doing this. The local papers don't seem to be close to being able to do what you do. Well done Lee, now when are you going to run for office? Lee, I want to join the others in thanking you for the reports you provide us. This is a lot of work on your part, and it so contributes to the citizenship of all of us.